Sunday morning our plan was to try something new! Earlier this year, a new diner opened in Woodbury, it’s called the County Seat Diner. It’s not a free-standing diner like we’re used to and because of parking limitations in Woodbury, we just never got around to going. My sister Ele has been there on a number of occasions and highly recommended it. We decided Sunday was the day to try it. We were up and out early and were able to park in the public parking area that’s about three blocks away which was not a big imposition. No traffic made crossing streets easy. We could tell that it was a different type of atmosphere as soon as we walked in. It was bright and everything looked new and welcoming. The staff was welcoming as well. The young lady who greeted us and seated us turned out to be our server as well. Her name was Nicki and I swear she treated us as though she had a stake in the business. She was so friendly and ready to offer anything we needed as well as any information we wanted regarding menu questions. The County Seat’s menu is not as extensive as some other diner menus I’ve seen, but I’m sure it will be a work in progress as with most diners. Still, lots of choices and Nicki kindly gave me a take out menu to take with me which is their full menu. The County Seat occupies a location with a very long tradition as a restaurant in this area. I’m not sure if it was the original business, but for years it housed the Homestead Restaurant. That’s what it was when I was growing up and it was a sad day when the Homestead closed. Other restaurants have occupied the space since the closing of the Homestead, but none have stayed for very long. I have the feeling that the County Seat has a good chance of carrying on the Homestead’s long tradition. Yikes!! This is the Mediterranean Omelette. The County Seat gives you four eggs in an omelette rather than the three eggs we’re used to seeing. This included spinach, tomato, mushrooms, onions and feta cheese. I asked for the sliced tomatoes instead of hash browns, because I saw that they had biscuits and I wanted to try one. I’m not sure if they were just being nice, but they gave me two! The omelette was delicious! I only finished about half because it could be reheated and the biscuits would not be as good if they were reheated. The biscuits were some of the best I’ve ever had. We don’t often see biscuits offered around here so this was a treat for me. Fresh and hot and so good with jelly. Oh, yes…the Coffee was really good too! Everyone was so friendly. 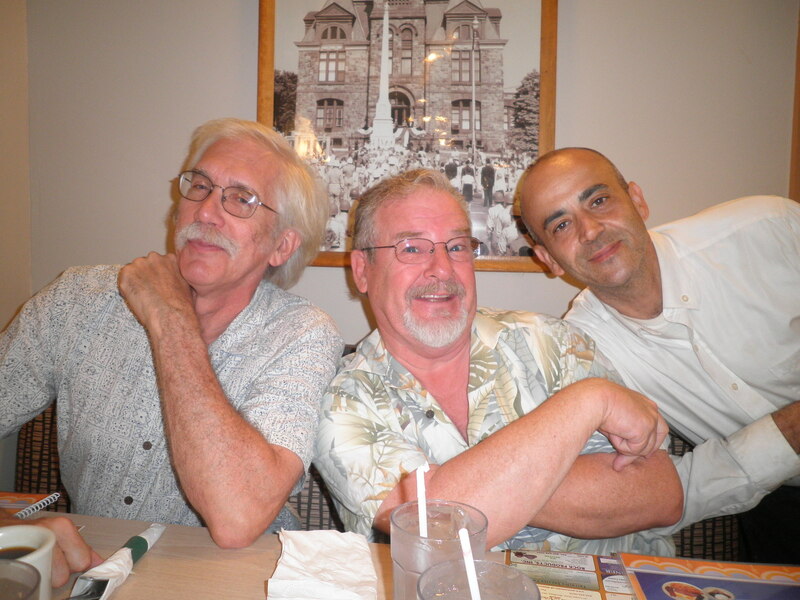 I tried to take a photo of Jim and Ralph and we got photo-bombed by another waiter named Chuck! 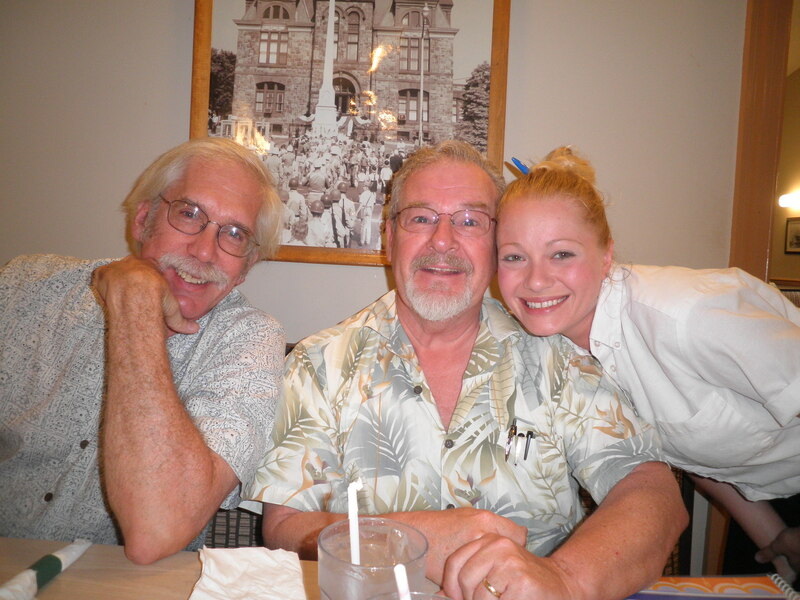 Ok…Take 2 with our waitress, Nicki! The prices were quite reasonable especially when you consider the size of their servings. There are a few vegetarian friendly menu items other than breakfast and they do offer a veggie burger. I think I’ll try to encourage them to offer more veggie friendly dishes. Because I do think we’ll be going back. Everyone made us feel very much at home and the food and people were Great! 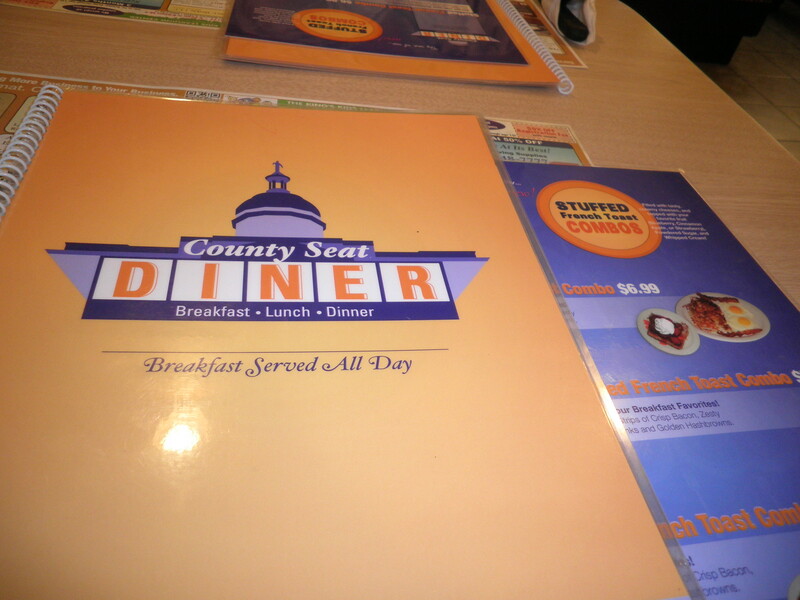 Try the County Seat Diner…I think you’ll like it! Now I get to go eat the second half of my omelette! Happy Monday! Happy Labor Day!! This entry was posted in Uncategorized and tagged breakfast, Urbanspoon, vegetarian. Bookmark the permalink. Thanks, Dana! I need to go eat the second half, I’ve been on the computer TOO long and I’m hungry! Happy Labor Day! I love biscuits but somehow “forget” about them. And I would love to have that omelet right now (but I’m feeling kind of lazy…). Have a great day! This was just excellent, Stacie. Even reheated it was still good! I wanted to share with you one thing that a local breakfast place did for me. When I asked for tomatoes instead of potatoes the chef asked if I would like them grilled. I loved them that way. Try it some time. Ginny, that’s a great idea and I never thought of it…I’ll have to ask the next time. That would probably help especially when the tomatoes aren’t local, they’d probably have more flavor. i really enjoy reading your restaurant reviews, fran! what a lovely outing for a holiday sunday! enjoy your labour day…hope there is lots of reading time, not too much labouring! Glad you like the reviews, Cathy! I used to feel bad saying negative things about a place, but now I’ve decided to just be honest. I don’t have to be nasty, just honest. This place was great although interestingly, I read some bad reviews of it on Yelp. I think that may have been when they first opened and it’s hard to get in the routine when a restaurant is new. Have a great day! 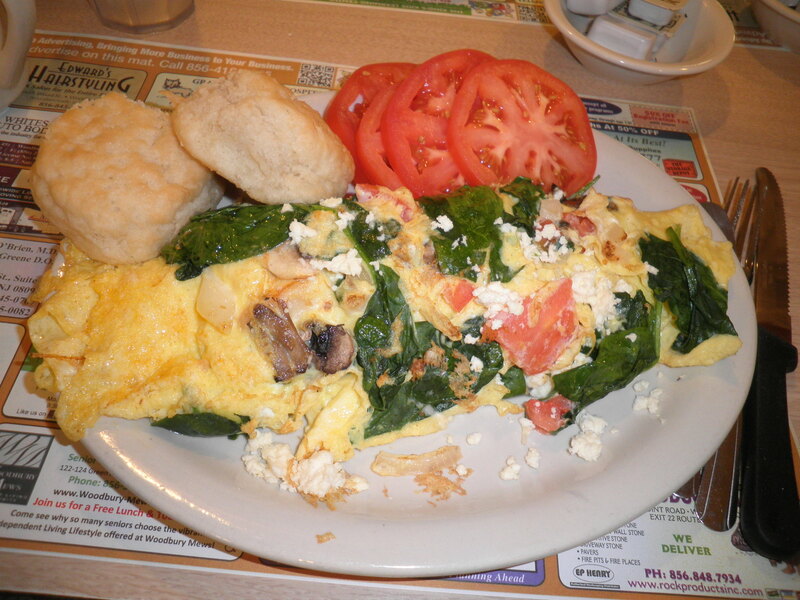 Wow…that omelette is just massive. I love biscuits…if you put them in front of me I will definitely eat them all. It’s always nice when you try a new place and it pays off. It was great, Zo! Just coming back from NM where biscuits are offered in most breakfast places (and I am a BIG biscuit fan!) I was so excited to see them here. They’re not a NJ staple. We really liked the place! I really love this place. I went there three times in three days! The food is great, the owner and staff very accomadating and the place is so bright and cheery. Glad we finally had a chance to try it and that it was with you and Jim, Ele! I’ll have to try Jim’s suggestion sometime…Benedict Florentine…sounds like a detective in a 1940’s film noir! Aw, Fran, that sounds like so much fun!!! 🙂 And wow, that omelet looks amazing! We had a great time, Liz! It would be a great place for a foodie blogger meet up if I could find any other foodie bloggers around here! You’ll have to head to NJ for one!